Micro Kits 05 by Delect comes with 5 masterfully designed electronic drum kits by electronic duo Delect, a new collaboration between Chris De Luca [Funkstörung] and Leonard de Leonard [Leonizer Rec.]. The kits will work in nearly any electronic genre, from techno to hip hop. To celebrate Twisted Tools 3 year anniversary and thank you for your support, Micro Kits 05 is being released for FREE. Get it here! The sample pack’s kits are formatted for a wide variety of samplers, providing instant inspiration within nearly any type of production environment. Additionally, MK05 features a custom Reaktor map and presets for Twisted Tools S-LAYER. By harnessing the power of S-LAYER’S advanced randomization and sample layering engine, the possibilities for generating new content from MK05 is literally endless. MK05 comes with over 40 S-LAYER kits and generator presets to get you started. 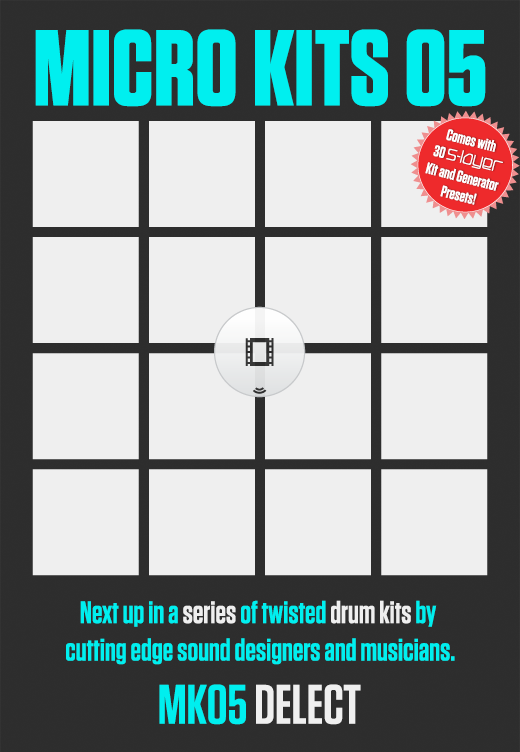 5 Drum Kits with 16 sounds each, designed by Delect. About Delect - The Neapolitan-Bavarian de Luca and the Parisian-Berliner Leonard decided to join forces in 2011 and create their own melting pot. The result of this culture clash is officially called DELECT. Only the highest quality organic ingredients go into their delicious, aromatic creations. Freshly imported Neapolitan espresso fuels the duo as they develop new sound forms. Their complex arrangements elegantly flow on each of their high tech productions. This synthesis of cultures and genres will surprise you with its innovation and diverse offerings. About Chris De Luca - As Funkstörung, CLP and as a solo artist, Chris de Luca released an uncountable amount of records on !K7, Boysnoize Rec, Shitkatapult and many more. His remixes for Björk, Wu-Tang Clan, Apparat and The Glitch Mob have attracted worldwide attention and acclaim. de Luca’s diverse music portfolio shows his passion for electronic music and hip hop and his dedication to defying conventions. His innovative, bass heavy sound is a radical and refreshing take on the stale electronic music scene. At least 140mb of available disc space. Approx. 20mb of available RAM/per kit in use. Any PC or MAC program that can read 24bit/44.1khz WAV files. The package size for this download is approx. 64MB zipped, so please allow yourself ample time to download the file if you are on a slow internet connection. On a fast connection, you should be able to download the package in about 2 minutes, while on a slower connection it may take up to 15 minutes. If you have any issues, please feel free to contact us 24/7 for help. Please consider using Firefox and the free download extension, Down Them All, if you are having problems with your downloads timing out. Get it at the Down Them All website.